It’s important to wait until your baby is at least six months old before you start introducing solids. Then, once your baby is ready, there are a few things you need to know before you start tempting her taste buds with solid foods. Many parents try to start solids too early, says Ellen Desjardins, a community nutritionist with the Waterloo (Ontario) Region Community Health Department. But babies younger than four months have an immature digestive system, which makes them more vulnerable to food allergies and less able to digest solid foods. Once your baby is six months old and can hold her head up unsupported (and also starts taking an interest in what you’re eating), you can start her on the road to solids. Introduce one food every three days (or even every week) to watch for allergic reactions, and delay the most allergenic foods until after 12 months. 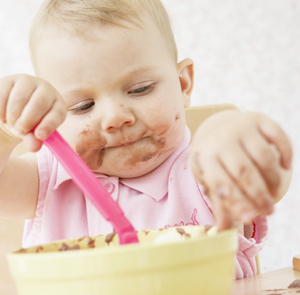 Starting solids one at a time makes it easier to identify any foods your baby has a reaction to. Unfortunately, says Desjardins, food allergies are on the rise and younger babies are more susceptible than older babies. Start new foods slowly, with one or two tablespoons at a time, and talk to your doctor if you have any concerns. When it comes to introducing foods commonly associated with allergies, such as milk, egg white, soy, wheat and fish, it’s best to wait until your baby is at least one year old to introduce them, and three years of age for peanuts and other tree nuts. Start solid foods in this order: iron-fortified cereals, vegetables and fruits, and protein foods such as meat. There isn't anything magic about this, says Desjardins, and some older babies who would otherwise be keen on solids may be turned off by the bland rice cereal often suggested as the first food. A six-month-old doesn't necessarily need to start with something the texture of wallpaper paste, and may be happier with a more substantial baby cereal (oats or barley), or mashed carrots, sweet potato or banana from your plate (thinned with a little breast milk, formula or water at first). The advice to start with vegetables before fruits comes not from a nutritional advantage, but from the fear that babies who have developed a taste for yummy fruits will refuse their yucky vegetables. But the truth is, babies are like adults and may have a preference either way, so it’s okay to introduce fruits and vegetables at the same time. And, once your baby starts getting the hang of things, don’t be afraid to add a little flavour to purées by mixing in fresh herbs, or adding a little ground cinnamon to some puréed sweet potato.